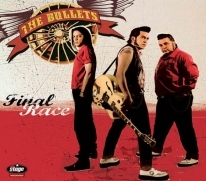 THE BULLETS with their first official album come to make a noise in the rock 'n' roll scene internationally! Everything on this album seems to be perfect! Starting with the well-done double "gatefold" digipak cover of awesome artwork, lyrics, credits and cool band photos. "Final Race" is Thee accomplished rock 'n' roll album which is not only destined to the aficionados of the past decades but to all the open-minded people with a taste in music!